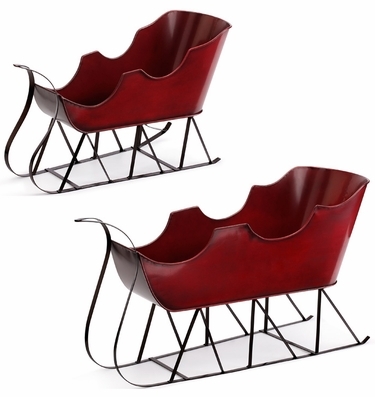 Just in for the Holiday season, you will love our new set of Red Christmas Table Sleighs! Fill them up with mini wrapped gifts, decorative fruit, or even fake snow to add just the right touch to your festive table decor. Bring wonder and joy to every family meal this season as you and your loved ones fill up your plates and enjoy being together. Add festive elves, a mini Santa or even Rudolph to complete your holiday table scene. Size: Small: 10"H x 17"L & Large: 15"H x 22"L, Metal w/liners included.